Industrial interior design has taken the world by storm, filling kitchens and living spaces with polished steel and intricate metalwork. More recently, this trend has made its way to the bathroom. Here’s what it takes to recreate the sleek and sophisticated look of industrial interior design in the bathroom. To get started at creating an industrial bathroom, it’s a good idea to take a note from factories and warehouses. Interior stylist Sara Emslie says basic industrial design is characterized by elements that draw from these types of buildings. For example, basic white subway tile with a beveled edge is common in industrial bathrooms. Plus these same tiles in metallic finishes can be paired with dark gray grouting for a more modern and luxurious bathroom look. Industrial interior design can also assume uniformity. Wide, gray tiles across the floor and ceiling, for instance, create a look that is both sleek and seamless. Elegance Tiles shows how the continuation of a single color keeps things homogenous, and makes a bolder statement than having the walls and ceiling separate colors. This effect is most often achieved with dark gray in the bathroom, but other neutral colors like bronze or whites work too. Here are more specific ways to incorporate modern industrial design elements into a bathroom. Designer Lacey Nicolette shows one modern industrial bathroom design in which dark metal fixtures and a light-colored marble sink provide a punch of contrast. The sink faucet and handle add an industrial feel to the space and draw the eye to the metal lighting fixtures above the sink, complete with exposed bulbs. For something lighter and brighter, a warm metal such as gold might be a good choice. 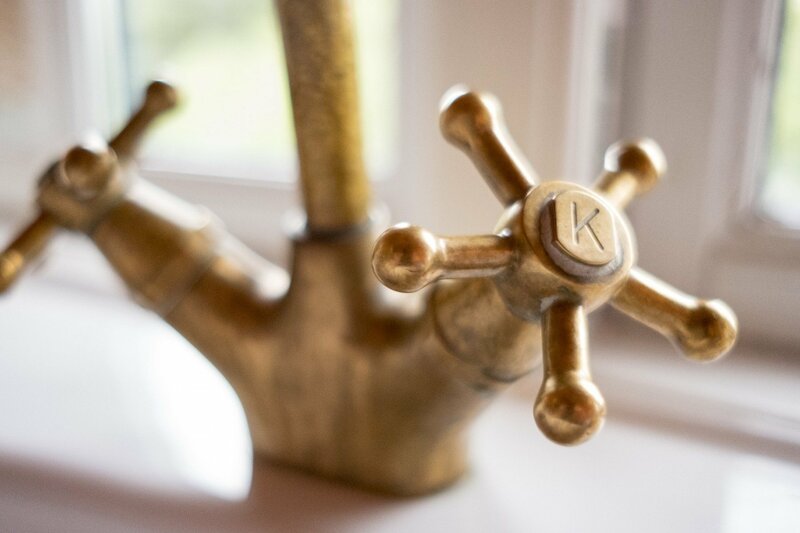 Real estate writer Tara Mastroeni shows how gold can be used in a modern context to make an industrial bathroom both trendy and inviting. While gold is typically thought of as a chintzy 80’s-inspired element, Mastroeni says it can work when incorporated into cutting edge shapes and accents. A waterfall faucet or a minimalist shower head are smart ways to incorporate gold metal in a way that feels tasteful and elegant with a Scananavian bathroom look. Exposed pipes are another hallmark of industrial interior design. Decoholic founder Melina Divani explains that pipes detached from the wall add a vintage touch and preserve an old and historical look in the bathroom. Dull metals are the best option because they look more authentic and don’t draw too much attention. Many older houses already have exposed pipes, so industrial design could be a good route for homeowners seeking to work with an older space. Even if the home you’re helping design isn’t historic, however, that doesn’t mean you still can’t adopt this look. For example, you could add piping as a decor element. Real Simple senior editor Katie Holdefehr shows a bathroom that leverages gold leafing along a pipe for something fresh, warm and unique. Quartz makes a great statement in a modern industrial bathroom due to its subdued, yet shimmery nature. Quartz retailer QuartzMasters USA says that the stone doesn’t have to be reserved for countertops, and suggests adding it to the walls in place of tile. This looks sleek and finished and doesn’t cause the problem of traditional grout. Grout can be difficult to clean, so opting for a solid quartz wall might keep things more low maintenance. Homeowners might also consider the benefit of using concrete pavers for the wall. Madison Vandenburg at Hunker shows how pavers, or concrete blocks, fit together with brass fixtures and exposed piping for an interplay of elegance and starkness. Concrete pavers vary in color and texture, so add a more interesting look to a wall than solid stone. Concrete is one of the best ways to create an industrial look in the bathroom. However, it’s important to be selective and specific about where concrete is incorporated for the best effect. Photojournalist Joanna Tovia says that a concrete vanity countertop is an easy way to elevate the chic feeling of an industrial bathroom. This is especially true with a floating concrete vanity, which can amp up the sleek feel of the room. Another idea for incorporating concrete tastefully in the bathroom comes from architect and designer Aditi Garg. She writes that wood and concrete are a great pair for creating an industrial look that leans towards more modern and Scandinavian styles. You might consider having wood cabinets and mirror frame along with a concrete countertop and sink. Playing with the mix and match of these two elements can also help you create a more unique approach to industrial modern style in the bathroom. Industrial bathrooms can be adorned with more natural elements and colors to keep things warm and interesting. In a bathroom designed by Melissa Winn, a standing shower floor features round rocks in shades of brown and tan. There’s also a standing plant in the bathroom, but it’s not extremely leafy or flowery, which can actually detract from the industrial theme. Consider where pops of color would fit into the design too. Robert Nebolon Architects planned a bathroom in a unique floating house that would meet the utilitarian design of the home. In addition to assuming a modern industrial look with metal and wood, there’s also a bright yellow cabinet beneath the sink. This serves as the main focal point of the bathroom and helps balance the metal elements in the space. Industrial bathrooms aren’t meant to be entirely gray and stark, otherwise they truly would assume the look of a factory. Instead, industrial bathrooms echo a factory-like vibe with just a touch of glam, glitz and practicality. One idea of how to incorporate this look comes from vintage decor retailer Fat Shack Vintage. Here, a large round steel mirror is illuminated by exposed light bulbs that feature metallic colors. The hanging pendant lights themselves add brilliance, and are positioned to reflect brightly in the mirror, with the metallic colors on dual faucet fixtures lending even more shine.